Charge head first into the heart of myth with Pathfinder Player Companion: Mythic Origins! Whether your character's incredible powers come from physical mastery, eldritch energies, divine favour, or indomitable force of will, this volume will bring your mythic character to new levels of power and greater renown in the award-winning Pathfinder campaign setting. Pathfinder Origins presents a player-friendly overview of the roles of mythic characters in the world of Golarion, as well as a slew of new options and fresh ideas for mythic characters made with the rules from Pathfinder RPG Mythic Adventures. Discover where the Inner Sea region's most powerful beings first gleaned their power, how the deities interact with their mythic godlings, and what kinds of abilities the forces of Golarion are capable of wielding. Join the ranks of the mightiest heroes with Pathfinder Player Companion: Mythic Origins! Details on what it means to be a mythic hero or villain on Golarion, including how and where one can gain mythic power and hot spots in the Inner Sea region where mythic activity is rumoured to thrive. Universal path abilities tied to each of the core deities of the Pathfinder campaign setting, attainable by godlings and favoured servants of the gods. New path abilities for each of the six mythic paths, allowing archmages to walk among the stars and champions to span miles with a single leap. Mythic versions of the Inner Sea region's most iconic spells, allowing harrowers to infuse their readings with mythic power and Lamashtu's faithful to further enhance the waters of their foul god with vile energies. A new path ability and example trials that enable mythic heroes to become mortal heralds of their chosen deities. New spells, mythic variants, and magical items and artifacts befitting a mythic character. 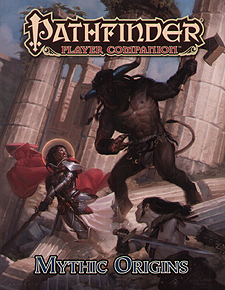 This Pathfinder Player Companion is intended for use with the Pathfinder Roleplaying Game and Pathfinder campaign setting, but can easily be incorporated into any fantasy world. This book is designed as a companion to Pathfinder RPG Mythic Adventures.